What is the role of the Director of Environmental Affairs? The Director of Environmental Affairs focuses on compliance with environmental regulations and requirements with the Federal Clean Water Act, Clean Air Act, Toxic Substances Control Act, Resource Conservation, Recovery Act and other regulations. The Director of Environmental Affairs monitors facilities, corporations, organizations, and other institutions for air compliance, water compliance, hazardous material assessment, analysis of emergency spill response, cleanup and project oversight. Some of the responsibilities that revolve around the Director of Environmental Affairs include emissions testing, and monitoring air pollution sources, from factories or facilities that contain or use chemicals in the manufacturing process, water inspections, storage tank inspections, as well as tracking and reporting where factories’ surface and groundwater goes to. The Director of Environmental Affairs must report spills, improper pollution, improper waste sources in a timely manner in order for facilities and other institutions to remain fully compliant. Flammable or non-flammable chemical storage lockers by US Chemical Storage offer compliance solutions for all of your inventory storage needs. From compressed gas storage to flammable liquid storage, US Chemical Storage provides the ultimate storage solution. Our chemical storage buildings are designed to exceed all EPA, OSHA and NFPA regulations, while meeting all FM Approvals and/or Warnock Hersey standards. Constructed from heavy duty, 12-gauge steel for superior strength and durability. All of our chemical storage buildings are painted with a chemical resistant epoxy coating for protection against severe weathering elements. 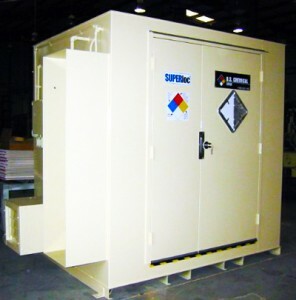 All of our chemical storage buildings are fully customizable to meet your exact specifications. Choose from our wide variety of customizable accessories including exhaust fans, cooling systems, heating systems, alarms, explosion proof accessories and more. Featured with a leak-proof secondary sump containment for containment purposes. Stay compliant and stay safe with US Chemical Storage. Our Strength is Your Security.